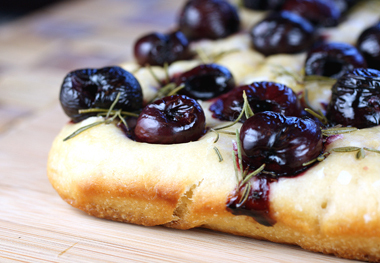 Fourth of July might be the ideal time to celebrate the last of the season’s fresh cherries with a bang. Those sweet, crunchy orbs come and go all too soon, don’t they? But Payson Fruit Growers has a way to let you enjoy them all year-round. Founded in 1964, the farmer-owned business processes tart cherries that are grown on local farms in the Payson, Utah area. Recently, I had a chance to sample some of their products. 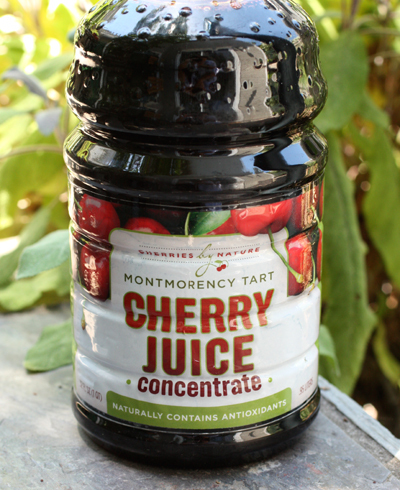 Some of the tart Montmorency cherries are turned into Tart Cherry Juice Concentrate ($18 for 1 quart). The thicky, syrupy concentrate is fabulous for adding to smoothies or to pan sauces for duck, pork or chicken. 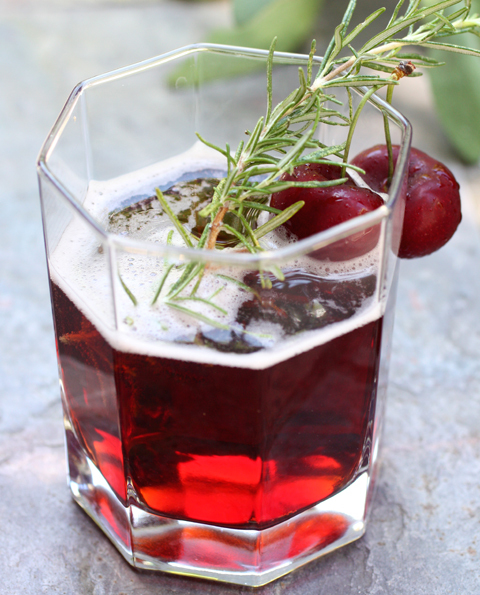 I stirred two tablespoons into 8-ounces of carbonated water, then garnished with fresh cherries and a rosemary sprig to make a refreshing summer soda. It’s super fruity and not overwhelmingly sour. But if you like it sweeter, you can add a tablespoon or two of simple syrup. Two tablespoons of the concentrate have 140 calories, 0g fat and 360mg potassium. The tart cherries also are dried (2 pounds for $11.38), making for some of the plumpest ones I’ve ever seen. They come as is or sweetened with a little sugar to temper their tang. They’re so fresh and chewy, you just want to eat them by the handful. But they’re also great for baking. 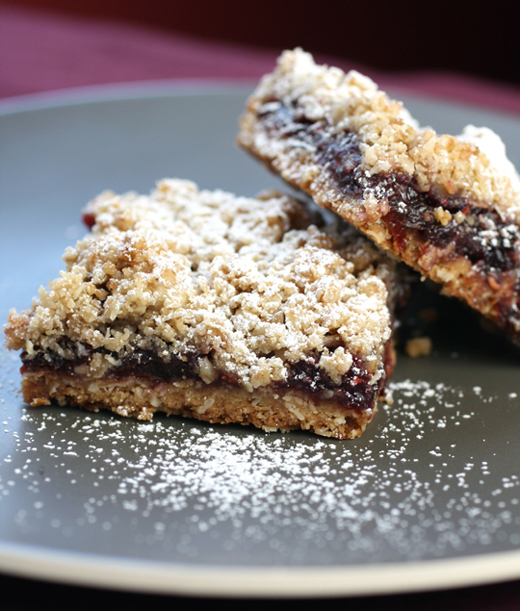 I used them in this straightforward, can’t-miss recipe for “Raspberry-Cherry Crumble Bars” from “The Art & Soul of Baking” (Andrews McMeel) by Cindy Mushet and Sur La Table. Flour, oats, brown sugar and butter are combined in a mixer or food processor until the texture of coarse sand. Half the mixture is pressed into a pan, then baked. Once it cools, you spread a mixture of raspberry jam and tart dried cherries over it, then sprinkle on the remaining flour-oat mixture before baking again. The recipe calls for “seedless” raspberry jam. I could get my hands only on the kind with seeds, so that’s what I used and it worked just fine. 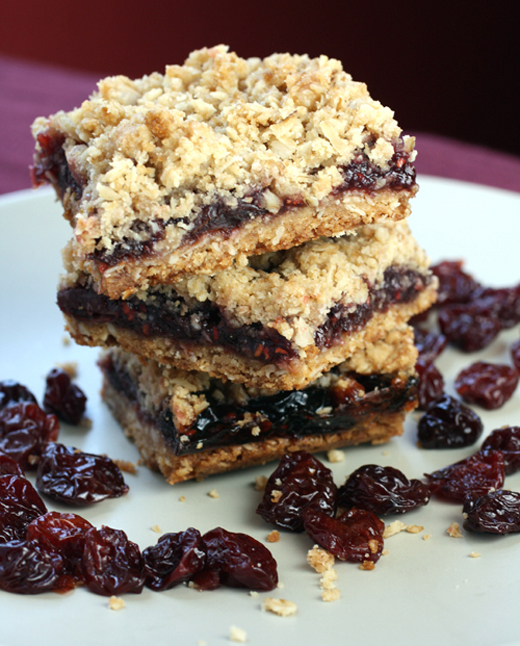 What you get is the crunchy, buttery, streusel-like quality of a fresh, sticky fruit crisp but in a cookie bar form that you can eat easily with your hands. The recipe calls for dusting the cooled bars with confectioner’s sugar before serving. But I kind of like them better without the added sweet flurry. When I sent my husband to work with some, his colleagues joked that they were going to jump him for the rest after trying just one. That’s how wonderful they are. Then, get ready to enjoy the taste of cherries any day of the year. Preheat the oven to 350 degrees and position an oven rack in the center. Line a 9-by-13-inch baking pan with foil across the bottom and up the two long sides, then lightly coat with melted butter, oil, or high-heat canola spray. Mix the crumble dough: Place flour, oats, brown sugar, and salt in the bowl of a stand mixer fitted with a paddle attachment and beat on low speed until evenly mixed (or place in the food processor and process for 5 seconds). Add cold butter and mix on low speed until mixture looks like wet sand and starts to form clumps, 5 to 6 minutes (or process for 45 to 60 seconds, pausing to scrape down once with spatula). Bake the bottom crust: Divide dough in half. Pat one half into an even layer in the prepared pan. Set the other half aside. Bake for 20 to 25 minutes, until golden and crisp. Transfer to a rack and cool for 20 minutes. Leave the oven on. Make filling: Empty jar of jam into a medium bowl and stir well to break up any lumps. Add cherries and stir until well mixed and all the cherries are coated with jam. 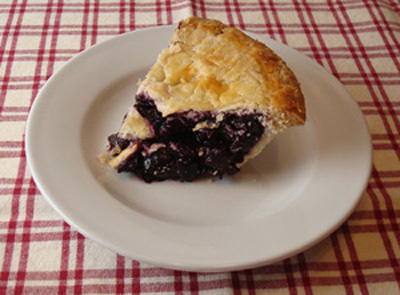 Spread evenly over the cooled crust, all the way to the edges. Sprinkle the remaining dough evenly over the filling. 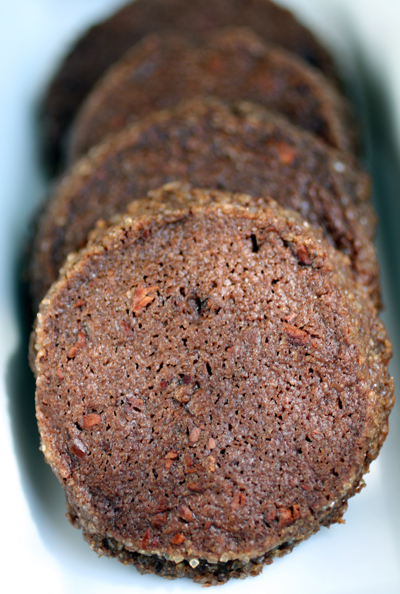 Unmold the cookies: To serve, run a thin knife or spatula around the edges of the pan to loosen any dough or filling. Lift the cookies out, using the foil as handles and place on a cutting surface. 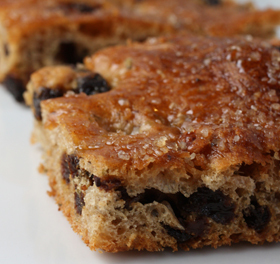 Cut into 3-by-1-inch bars. Just before serving, use a fine-mesh strainer to lightly dust confectioners’ sugar over the cookies. Storing: Keep bars in an airtight container between layers of parchment or waxed paper for up to 4 days at room temperature. Dust with confectioners’ sugar just before serving. Getting Ahead: The bottom crust can be baked and the bars assembled (but not baked) and frozen in the pan for up to 6 weeks. Wrap tightly with two layers of plastic reaching all the way around the pan. To bake, do not defrost; simply unwrap the pan and bake for a few extra minutes. Variations: You can change up the filling flavors to suit your tastes and occasion. Use only jam in the center, and leave out the dried fruit. Or try a layer of quince paste, fig spread, or poppy seed filling instead. Change jam and fruit pairing to other tasty combinations such as apricot jam and snipped dried mango; orange marmalade with dried, sweet-tart cranberries; or cherry jam with snipped apricots. You can even flavor the dough to accent the filling, such as adding 1/2 teaspoon almond extract during mixing, then scattering a handful of sliced almonds over the top of the bars just before baking. Or leave the fruit out altogether and cover the dough with a layer of Nutella.